She was named after a famous surf break on Ireland’s wild north-west coast. It’s little wonder that Easkey Britton went on to become a five-time national surfing champion. 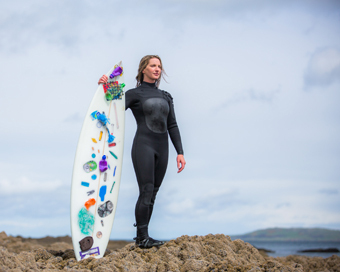 Easkey stood on her first surfboard at the age of four, and she says surfing and the sea have shaped who she is. “It’s been an amazing driving force in my life. I think that’s an incredible thing for a young woman”. With two decades of competitive surfing behind her, Easkey has always seen competitive surfing as a means to explore and travel and to experience new places and people. Eight years ago, an opportunity arose to introduce surfing to a remote region of the world through a travel writer ‘friend of a friend’ who was part of a group planning to visit Iran. When plans for the original group members fell through, Easkey forged ahead with French filmmaker Marion Poizeau; the two women formed a close bond as a result of the positive experience. Inspired by this experience, Easkey co-founded Waves of Freedom, an initiative which uses surfing as a medium to creating positive social impact and empowerment for marginalised communities worldwide. These days Easkey’s main focus is on the therapeutic and restorative benefits of surfing and water on human health. As a research fellow at NUI Galway, she co-leads a multi-disciplinary team with ecologist Caitriona Carlin, working on the Nature and Environment to Attain and Restore (NEAR) Health Project. This three-year project, funded by the Environmental Protection Agency and the HSE, is exploring the link between human health and the environment and the interactions that we have with the outdoors and nature. Easkey is fascinated with the concept of ‘Blue Mindfulness’; inspired by the book Blue Mind, it explores the idea that there’s a psychological effect on us when we’re on, near or in water. Alongside her research, she runs retreats and workshops on leadership for women and creative storytelling. Easkey believes that most environmental problems are not problems with the environment, they are issues at a social level. And storytelling is key to solving those issues.